Hot Tub Maintenance North Carolina: Welcome To Our New Site! 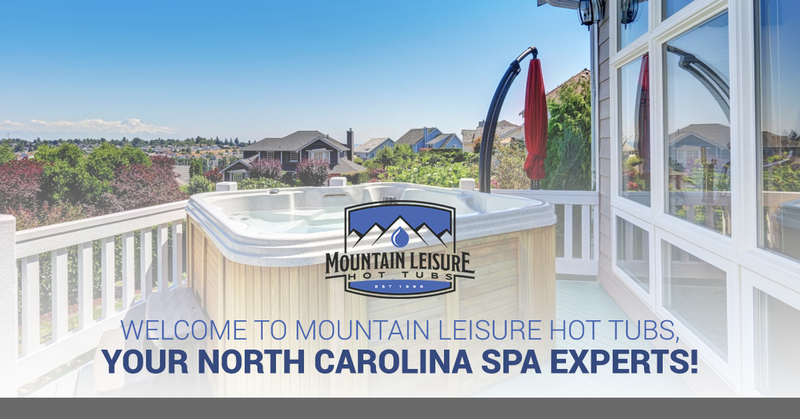 Welcome to Mountain Leisure Hot Tubs, Your North Carolina Spa Experts! Here at Mountain Leisure Hot Tubs, we’re dedicated to your comfort. We know how important hot tubs can be to the owners because of the physical, mental, and social benefits. Plus it just feels good to get in a hot tub, no matter the temperature outdoors! That’s why we not only sell used and new hot tubs; we also deliver top-notch hot tub maintenance service. Let’s take a closer look at what our hot tub company can do for you. Whether you call it a hot tub or a spa, it’s going to need regular maintenance. The best way to make sure that your hot tub is always ready to use is to make use of the hot tub service we offer. When you sign up for one of our many service plans, you’ll be able to choose the exact level of service you need. If you want us there weekly to keep your hot tub in perfect shape and make sure the water chemicals are expertly balanced, we’d love to have you as a customer. On the other hand, if you just want us there once a year to make sure everything is running properly, we can do that too. Need hot tub maintenance somewhere between those two? We have monthly, quarterly, and semi-annual plans. We love hot tubs, and we know just about everything there is to know about them. Because we recognize the benefits that people get from them, we want to make sure that everyone who comes to us gets exactly what they need. That’s why we sell both new and used hot tubs so that you can find the exact make and model for your budget. At Mountain Leisure Hot Tubs, we offer a myriad of new hot tub options from different hot tub companies such as Dynasty Spas, Hawaiian Breeze Spas, and Viking Spas. We work with these companies because they offer top-rated hot tubs and because of the variety we can give our customers. Hot tubs from these companies can accommodate between one and eight people, meaning that you can choose single-serving or party size! There’s another option we should mention, simply because it’s so practical. We offer swim spas, which are hot tubs that not only work as a regular spa but also as an individual pool. They’re a great option for someone who wants to get exercise and relax as well. There are many reasons why someone might sell their used hot tub to us. Sometimes they’re trading up, and having us take their old hot tub away and delivering their new one at the same time just makes sense. Some people move into a house with a hot tub but aren’t interested in dealing with the spa maintenance, so they sell it to us. No matter how we get a used hot tub, we put it through an intensive seven-point refurbishing process before we sell it as a pre-owned hot tub. We perform multiple tests and replace parts as necessary and give it a thorough cleaning inside and out. We’ll also clean the acrylic to make it look as good as it possibly can. Not only that, but the customer gets to choose the color of the hot tub spa cover we top it with. Whether you’ve purchased a new hot tub from us or got a used hot tub when you purchased your home, it’s important to know as much about it as possible. When you’re better informed about the workings of your hot tub, you’re going to make it last longer, require fewer repairs, and save water and energy. Let us teach you how to make the most of your spa, whether you have a big hot tub for seven people or a small one that just fits two. Sometimes the body of your hot tub might be in great shape, but certain internal parts are severely out of date. Perhaps these parts are causing you to lose too much heat or water. Or maybe you visited a hot tub company and are envious of the models that you can start up with your cell phone! If you have a specific want in your hot tub, we can very likely retrofit your existing one with upgrades. Hot tub parts wear out or become damaged, which necessitates repair. Sometimes it’s just due to the effects of time, and other times it’s because someone has neglected their hot tub maintenance. No matter why you need spa repair, we can get it back up and running in no time. Hot tub spa covers are an integral part of owning a hot tub. First of all, they save energy. They also save water, which keeps the chemical balance correct. A cover ensures a hot tub stays cleaner, keeping leaves and insects out. Most importantly, they can be an important safety feature if there are children in the home. When you are looking for hot tub covers for sale, Mountain Leisure Hot Tubs can offer you one that will perfectly fit your particular unit and look great at the same time. Learn more about our hot tub covers right here. There are some items that should always be moved only by a professional. Pianos come to mind, and safes are another. Hot tubs are certainly on that list. If you’ve sold a hot tub to someone and promised delivery, we can make it happen for you. If you’re remodeling the outside of your home or building a new deck, we can move your hot tub out of the way for a while and then move it back when you’re done. And if your hot tub is beyond repair, we can come perform hot tub removal and haul it away for you. We’re the experts in hot tub installation, so it only makes sense that we have the equipment and know-how to safely move or remove a hot tub. If it has to do with hot tubs, you’ve come to the right place. Schedule an appointment today!